1. To make every endeavour in order to satisfy existing and suppositional needs and expectations of a customer as quickly and well as possible and to ensure a stable and high quality of products supplied and services rendered by using high-quality materials. 2. To develop and design new furniture on the basis of assessment of customers’ needs and introduce new technologies and equipment allowing us to supply products of higher quality to our customers and to use resources more efficiently, thus reducing the impact on the environment. 3. In order to ensure the quality of incoming raw materials and services to purchase them only from reliable and proven suppliers and to control the impact of raw materials and substances being used on the environment. 4. To use environmental resources prudently in our business activities, prevent pollution, waste generation and unexpected dangerous situations and aim at their reduction. 5. To work according to applicable local laws and other regulations covering our business scope. 6. To constantly improve our employees’ qualificationacquired together with education, theoretical and practical training, development of skills and work experience. To ensure employees’ safety, benevolent atmosphere of mutual understanding and encourage them to be loyal to the company and achieve better results in the field of quality improvement and environmental protection. 7. To improve operational efficiency by encouraging employees’ procedural approach and the introduction of new IT projects in the accounting system. 8. To maintain the quality and environmental management system, constantly improve it, analyze its results and improve its effectiveness in accordance with international ISO standards, LEAN, TOC and 6 Sigma best practices. 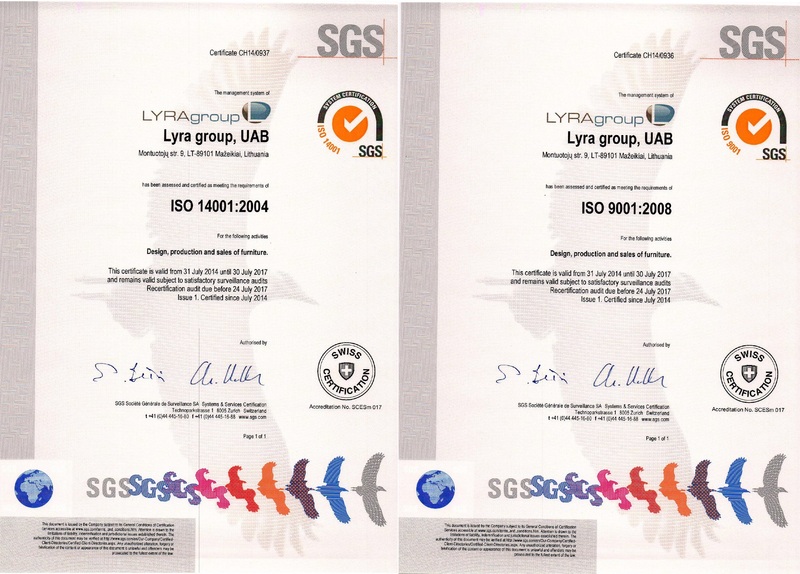 The management of UAB “Lyra group” undertakes to implement the present Quality and Environmental Policy, provide necessary resources required for implementation of objectives set according to and on the basis of the Quality and Environmental Policy and invites all employees of the company to achieve a common goal.